Welcome to the world of fine dining… Art style! A hearty rustic dish with one of the worlds best ingredients. An easy dish to create when you need that poshness in a hurry. Plus there’s bacon and maple syrup to make it just a little more Canadian. Bon appétit! • Start the polenta (aka corn grits) by bringing the water to a boil in a saucepan. • Add the polenta to water gradually while stirring with a whisk to avoid lumping. • When mixture begins to spit lower heat & simmer for approx 40 mins stirring occasionally. • When mixture is cooked it will be a very thick porridge. Add cheese and stir until creamy. • Cover with a lid and keep the mixture warm . • Place the scallops between paper towel sheets, pat dry thoroughly then set aside. • Heat skillet over med/high heat then cut bacon strips into 2 inch pieces and fry in the heated skillet, turning over then the bottoms are browned. • Remove crisp bacon squares and set on paper towel then place the scallops to cook in the same pan. Drain some of the bacon grease but keep enough to fry the scallops. • When scallops are browned on the bottom, turn over and add minced garlic. • When the garlic begins to brown, add butter and syrup to the bacon and stir the mixture until it all looks brown & caramelized. 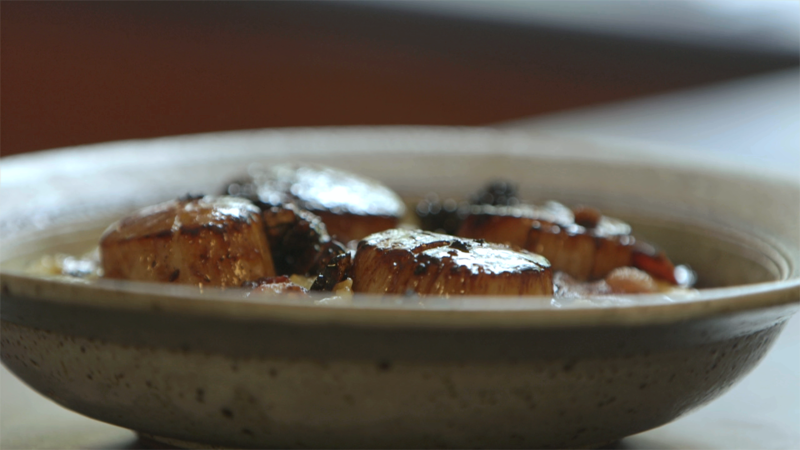 • Place scallops over a bowl of warm polenta and pour mapled bacon butter & all contents of skillet overtop. Serves two.